Through this portal, for the first time you can access from a single place to the relevant information on all the scientific institutions in Euskadi. In this way, any researcher who works in Euskadi or wants to come here, will find in a single web all the relevant information about Euskadi such as scientific research centers, job offers, a complete map of scientific infrastructures within their reach and a directory of hundreds of research groups, as well as information about the Euraxess service center, a European initiative to help scientists who move to different European regions, including Euskadi. Strengthen collaboration between researchers, centers and companies, thus generating a dynamic and multidisciplinary community. Contribute to the prestige of the Basque Country as an international reference in the scientific and technological field. In this platform, all the institutions of the Basque Country upload and disseminate their job offers in a single centralized point. This portal is also synchronized with Euraxess - Jobs, so that the positions offered here are also published on this international page. The number of posts disseminated through this tool has grown every year, currently standing at around 100 calls per year. This website includes the official Euraxess Service Center portal in Euskadi. In this section you can find all the necessary information for those researchers from abroad who are considering coming to Euskadi to work. Science.eus has included a repository of information in which all the institutions and research centers of the Basque Country can be consulted, in such a way that the basic details of each of them can be looked up in an easy and fast way. 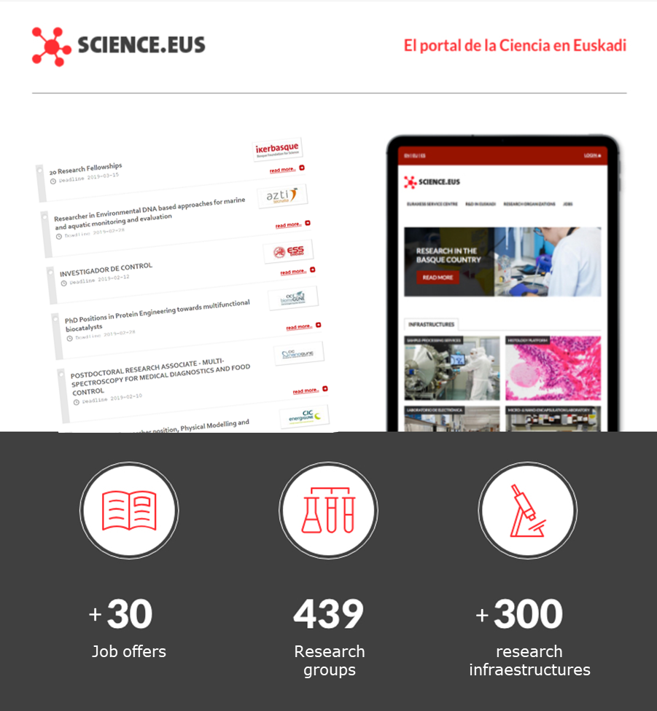 The web has incorporated a complete directory with the research groups of Euskadi, a total of 439 groups, recognized from the universities and the main research centers. This directory allows you to explore the groups that in Euskadi research in different areas, finding in an agile way the contact data of any group. Science.eus gathers in a portal all the scientific infrastructures of the country, so that a researcher who needs a specific tool (for example, a nuclear magnetic resonance, or a specific microscope), can find all the available ones in Euskadi with a simple search, instead of consulting one by one in each center. The map of scientific infrastructures counts today with the data of more than 300 infrastructures belonging to 40 institutions. Información sobre la estrategia de investigación territorial, así como del desempeño del Sistema Vasco de Ciencia. Information on the territorial research strategy, as well as the performance of the Basque Science System.